Over the last couple of weeks we have been posting a series of Father’s Day Gift Guides, based on gifts we currently have available for sale at The Paper Package. But today, we thought we’d focus on some fantastic homemade Father’s Day gift ideas that you could make yourself at home to celebrate on Sunday 4 September. You cant go wrong with home baking for any dad, and cupcakes are so easy to make. My favourite recipe is from Nigella Lawson – very easy – and then some buttercream icing on top (piped on using a glad plastic bag with the corner snipped off). Print out some of these fun printable labels and cupcake toppers, stick them on a toothpick and you’re done! 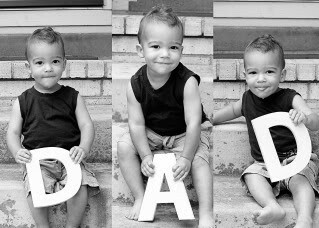 We’ve found a few examples of these on the web – and it seems such a simple, but really cool idea that Dads will love. You can find wooden letters in NZ from craft stores, Spotlight etc. I’ve also found a link online to Mums Know Best (we have no affiliation with any of these stores so can’t vouch for the product/service sorry). Don’t you just love Dadisms!! They are so much fun because they immediately transport you back in time to when you were about 8 years old again! Use these labels to make your own snack range, designed just for his tastes! The presentation of this is gorgeous – I don’t know where you would get the little spoons though, maybe from the Sallies or other second-hand shops? These are some amazing ideas! I personally love the D.A.D. photographs! I do accept as true with all the ideas you’ve offered on your post. They’re very convincing and will certainly work. fantastic put up, very informative. I’m wondering why the other specialists of this sector do not understand this. You should proceed your writing. I’m confident, you have a huge readers’ base already!